With some trepidation I chose today to watch the Hunger Games online — live video feed plus chat (moderated by Hannah Classen and Brian Francis). I was planning on blogging about it today, right after the big event but, well… I painted my bathroom instead. Then I did some laundry, played with the dogs, trolled the internet, you know. Yeah, it was that interesting. I found myself distracted by the inane commentary of the live chat — I spent some fascinated moments looking to see what Brian Francis was going to paraphrase; I started sending comments, just to see if they’d post them (see above). It was kind of fun, in a slighty nauseating kind of way. What does the winner of this get? And really, aside from amusing myself with the online chat stuff, I did listen, really I did. I’ve made this topic a bit of a speciality of the house, these past few months, and I do a lot of thinking about it. Aside from rummaging around my own big brain, I’ve been finding some bloggers/writers who are writing some pretty interesting stuff about #canadareads lately, as well. I mentioned the Walrus article in a previous post — essential reading, I think (more on that word, essential, later), and after much quiet out in the Districts (a Hunger Games reference, fyi) people are finally starting to talk. Charlotte Ashley over at Inklings has been writing some really great, funny and honest stuff. Her exasperation is a breath of fresh air. Bonnie Stewart, social media maven, wrote some great commentary here today in her blog. I like this, and I love the fresh, irreverent… frustration I hear in these voices. We’re all bookish sorts, we all love writing, reading, reading about writing — all of it. And what I am starting to hear is a sense of loss — where is the respect, the dignity that writing should have? What is the CBC doing to contribute to meaningful commentary about literature in this country? Is Canada Reads doing it? Nah. I can’t even go into depth on this one right now. It makes me tired and bores me. I’ve said it over and over again. Watching that train wreck today was like, I dunno… watching a pretend show about books. It was like a sitcom book panel — you had a smart and earnest young woman, a driven “career gal”, a business man, a sports guy (“life is a battle!”), and an Aboriginal actor/director. After an agonizingly long introductory session (with cheesy voiced-over slideshows for those watching online) with awkward speechifying, they finally got to the point in the show where they were supposed to, you know, debate. I must have nodded off for a moment because the next thing I knew, they were talking about books being “accessible” and “popular” and then some of them seemed to think that the point of the show was to discuss “getting kids reading”…. Nowhere did I hear anyone even attempt to qualify what “essential” means. I’ve been waiting for that for a while now, I guess I shouldn’t be surprised that it continues to go unproblematized. So what if the entire shebang is based on these books being “essential”, right? I think there’s a whooooooole lot of confusion in that post. (Where do they get their stats, and help me out here — is “semi-illiterate” better or worse than “semi-literate”?) I get what they are trying to say, but it’s a cobbled together mish-mash of ideas that culminates in the Grand-daddy of all concepts. I refer, of course, to that of the “Gateway Book”. 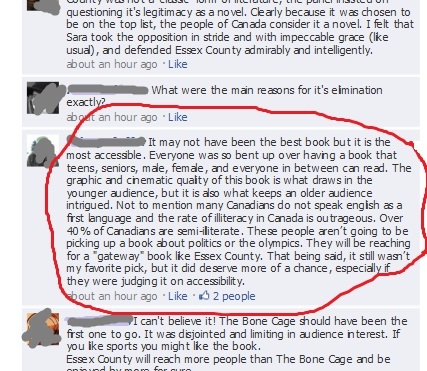 Books are now about being “accessible” (which I guess in our culture now means “easy”?). At this point, I would be happy if they went back to talking about “essential” — somehow that’s less offensive to me. “Accessible” means “easily approached or entered” (according to my quick but hilariously apt google search for a definition). At least “essential” implies worth of some sort. In my world, “accessible” means that all people are able to access the material, not that the book is easy for “semi-illiterate” people to understand. I'll bet she's reading Lemire's book right now! But. um. Gateway book? hee hee. What’s next, reading chapter books? Staying up all hours of the night reading? OMG, what if they start to read… poetry. 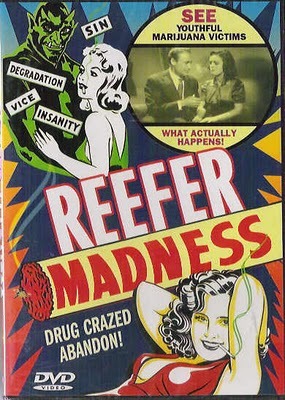 It’s like Reefer Madness, but with words. You know, it seems harmless at first, you let them read a few picture books, some comics, then a graphic novel… then all hell breaks loose — they’re reading everything and don’t care who knows it! It’s as if writers (and Canada Reads judges) are now the social workers of the reading world. They have to get those kids reading, and it has to be easy, that goes without saying. Sorry, so easy to get carried away. There’s almost too much to think about here, and so little time. Tomorrow this will start all over again. We will hear Georges say that life is a battle. We will see Ali Velshi do his thing — slyly clever schtick-y sound bites that upon reflection don’t actually say much. Debbie Travis — successful mogul Debbie — will continue to slide her eyes down and sideways and tell us how nervous she is. Lorne Cardinal will be thoughtful but not forceful (I almost forgot he was on it for a moment there). Sara Quin will be articulate and free to speak her mind, and flush with the power of being a swing vote. Who’s going to get kicked off tomorrow? I think they must be going in reverse order, from best book down, so I think Carol Shield’s finely realized and beautiful book Unless will be the next to go (in my mind they were tied for 1st place). I don’t like it, but there you go. Essex County is a great book, and it made me think about novels and the creative process in ways that many other books haven’t in a long time. Personally, I’m pretty sure that none of those five books are the “essential” book of the decade. Maybe someday we’ll all have to have a little chat about that — which books we think are essential. First, lets define essential though, okay? And she didnt’ even need all the time! oooh, i’m not a maven! i just play one on the internets. and i do like the play of social media, i swear to god i do. i don’t think literature needs to be all stuffy to be dignified. i think there can be dignity in all kinds of explorations…maybe even literature as playfully competitive sport. but the game can’t be a mere sham – as in the Literary awards stuff this year – designed to promote hits to the CBC site without fostering any real advantage or community or profile for the writers. that’s not sporting. hmmm. so if the best book went first, according to your theory, then what will win? Maven: a trusted expert in a particular field, who seeks to pass knowledge on to others. If the word fits, Ms. Stewart, then you have to wear it. Yes, I agree — play is almost essential. Dignity doesn’t mean stuffiness, not at all. I feel like this contest doesn’t take into account the work and craft involved in writing, or give the work the attention it is due. I think that it was screwy from the beginning and they came up with this cockamamie “essential book of the decade” thing, and then didn’t know how to follow through. It has always been a bit flawed, but this year it’s been made worse by their continuing to insist that these books are honestly contenders for the most “essential” book of the decade (who even knows what that means?). It’s the same old contest it has always been, but they put some lipstick on it and called it Special and we’re supposed to go along with it. I have to stop ranting. I think it’s because I read that Gateway Book a while back… I’ve been incorrigible ever since. The “gateway book” term often comes up in my writing circles. It’s usually used in reference to books like Twilight or Harry Potter – books that get people reading. These are the pot of books – it doesn’t appeal to you, but everyone’s doing it. Might as well give it a try. Krista, don’t go back to lurking! I hear you — I figured that’s what it was, but at the same time the concept is too funny… in this context anyway. 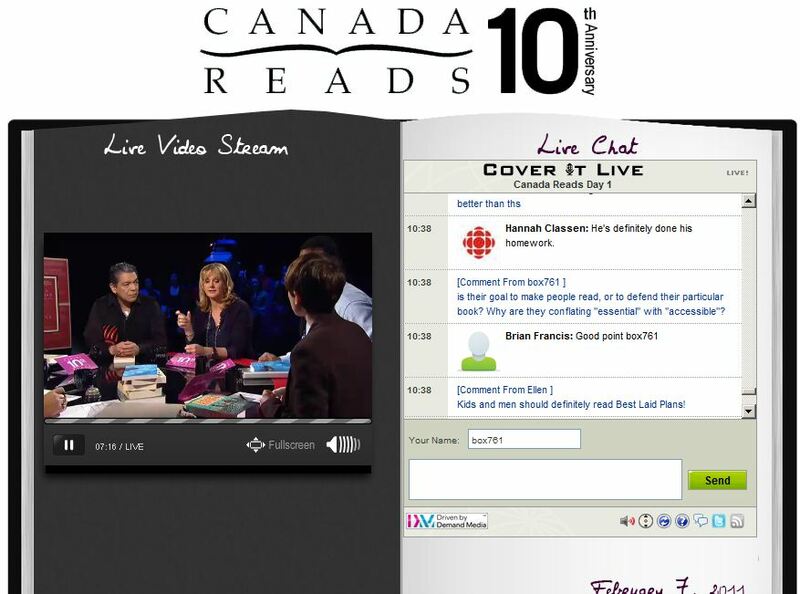 CanadaReads isn’t really here to crown the most accessible book — it’s stated mission is to choose the most “essential” book. Conversations about what’s easier for “semi-illiterate” people to read should not be entertained. Not for CR anyway. If they want to do another series (The Gateway Awards?) I’d be all over that — I love YA, and I have a soft spot for Harry Potter et al…. would love it. If they could do it on a country-wide scale, even better! Re where they get the statistics: Stats Can has released numbers sometime in the past decade showing that 48% of Canadian adults are what we used to call “functionally illiterate,” or unable to read effectively in one of our official languages at a Grade 10 reading level. I think it bears pointing out that these people are not Canada Reads’ intended audience. You are correct – those 48% (!) of Canadians who are functionally illiterate are not the inteded audience. I have, however, read all of the books, and think that any 10th grader could read them, so hopefully this will spur some of them on to read more…. The more I think of it, the more I like the idea of The Gateway Awards. Perhaps I should pitch it to CBC. I’m impressed this entry is so long; you must be exhausted from trying so hard. This entry is so pretentious and your blasé attitude so contrived that it’s hard to tell if it’s serious. Either way, it’s a snoozefest and you miss the point of CR so badly that your whole entry becomes meaningless. There were so many things wrong with Day #1 and you manage to tackle almost none of it. Thanks Steve. The many things that were wrong with Day 1 were already very ably commented upon by the bloggers I mentioned in the article, and by (ahem) me in previous postings. I chose instead to look at the bigger picture and framed my commentary around those things that I found most interesting to me at the time – namely that they are voting for something that they are labeling “essential” but haven’t bothered to define what that means.